Note: While this review will be spoiler free, it will make references to previous books in the series. If you haven’t started yet, check out VBC’s review of Firelight. In most paranormal romance series there is one character or couple that has been introduced in earlier books that I’m just itching to get my hands on. In Kristen Callihan’s Darkest London series that couple was Jack Talent and Mary Chase. Both Jack and Mary have been somewhat enigmatic characters before now, playing a supporting role. 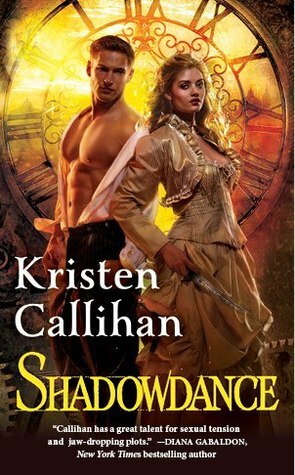 In the fourth installment Shadowdance, they take center stage and sparks most definitely flew. Teamed up as SOS regulators, they must seek out and capture the Bishop of Charing Cross, a vicious serial killer that has been stalking the demon population of London. After his capture and torture at the hands of the Nex in Winterblaze, Jack has withdrawn into himself. Fuelled by rage and a thirst for revenge, he is less than thrilled at the concept of Mary, the one who rescued him, dogging his every move. Mary is eager to move out of the shadows as Poppy’s assistant and prove herself as a full Regulator. The Bishop case is perfect, even if it does mean working with a man who’s inability to bare being in the same room as her is entirely mutual. As the investigation unravels, the hunters become the hunted as powers that were thought long ago dead rise. This team will have to learn to trust each other in the face of some of the most powerful and chilling adversaries to date. Shadowdance is a twisting action-filled read, with myriad characters that all have different secrets and agendas. While Jack and Mary are at this story’s center, it’s a large game, stretching far beyond just them. I loved how both big and small details from previous books suddenly took on a much greater significance as the story moved forward, making me want to go back a read all the books again with a fresh perceptive. I particularly loved gaining a greater understanding of the GIM, not just in their beautifully detailed clockwork mechanisms but also their creation and origins. If you like hate-to-love dynamics with bags of biting one-upmanship that crackle with sexual tension, then you’re in luck with Shadowdance. Jack’s dislike of Mary has always been a mystery and here we see that it’s actually an attempt to stave off an intense attraction based on huge feelings of guilt. Their history is so intertwined and we are left wondering for much of the book just what Jack knows that she doesn’t. I have to admit though, there were times were I was nervous just where this storyline was going. The depth and tragedy to both their backstories are heartbreaking and tough reading at points. Once they began to open up and trust each other, their relationship became so much more than blistering chemistry. It blossomed into a soul-deep need and I got swept away in the tender romance of these two characters, breaking down the walls they have built and learning to lean on someone. I feel like I’ve barely scratched the surface here but suffice to say, the scale of the overall story arc in Shadowdance, plus the twist and turns it makes, is vast. The growth in the world building has me more than intrigued, particularly the aftermath of this book for two newly introduced characters. But at its heart, Shadowdance is a tale of painful pasts and the healing power of love. I LOVE this series. It has me wanting to read more historicals and steampunk.